lighting, heating and cooling, appliances and water. 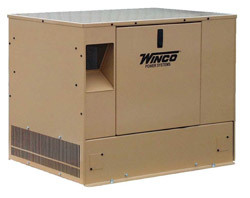 There’s no need for extension cords, gasoline cans for refueling, or manual start pull ropes because WINCO’s Packaged Standby System supplies back up electric power automatically. Generator set and components are factory built and tested to NEMA standards.